The Sting archive project is finally heading towards the final stretch, albeit there is still a large box of stuff to do and nothing in the archiving world happens quickly. I have backed everything up to a new set of Hard Disks and in turn each drive is being backed up to LTO6. I believe backup safety is in multiple copies across different media. It takes about fourteen hours to back up a two terabyte hard disk, that includes full verification. I tend to run the backup over night, that way I can go to bed feeling like I am still working and then when I get up before I do anything I feel like I have achieved something. Smarter than the average bear Boo Boo, whatever happened to Yogi Bear ? I have copied all but a handful of the 350 DAT tapes, BASF in particular caused me a lot of problems. 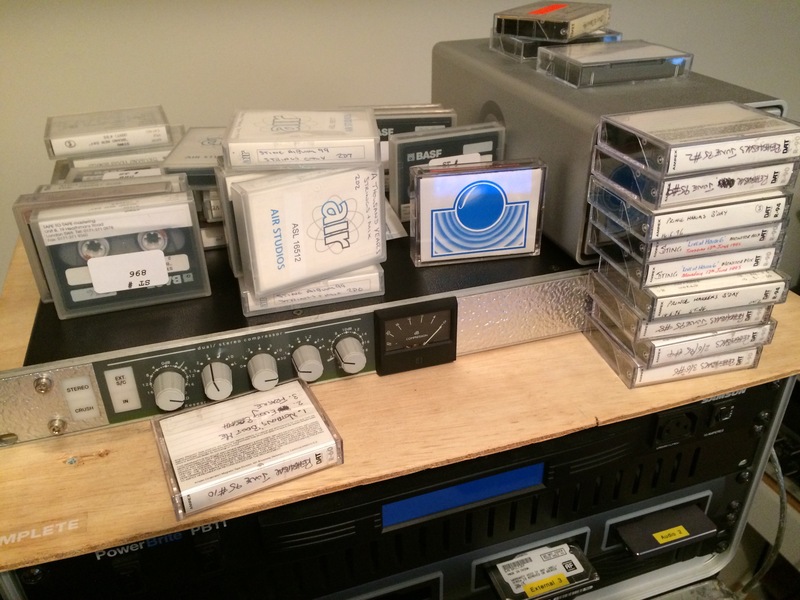 However, baking them at 40 degrees for three days did help a lot and made most of the tapes playable. Sadly Sting went through one particular period where every DAT tape seemed to be BASF, around the end of the last century, when he released his biggest selling solo album, Brand New Day. I’ve had a few tapes snap and I have repaired these by fitting each reel into new shells. It is a particularly fiddly job that requires a steady hand, patience and for me now, glasses !! At the beginning of February I went, at the kind invitation of G-tech, to the MPG awards at the Grovesnor House Hotel. Never been before, to the MPG or any other awards ceremony. I did debate going to Vegas when I was nominated for an Emmy but as I’m not a fan of the town I let that one go. So I drank for too much at the MPG awards bumped into some people I know that I haven’t seen for a very long time, which was a real pleasure, wish I’d had more time to talk to some of them, it’s only at industry things where you get a chance to chat and catch up. So I have renewed my Avid service contract for another year and looking forward to installing the next revision of Pro Tools, 12.5 I believe. I have upgraded to Melodyne 4 and planning to goto Omnisphere 2 as well. Although those few upgrades do add up in value quite quickly. I have recently really started getting into Kontakt, and am adding regularly to my library of sounds. There are some amazing instruments out there for Kontakt and at very reasonable prices, I have been buying and am looking forward to posting some of music later in the year. My favourite new toy is my S!NG™, it’s a phantom-powered precision reference tool. If you haven’t got one you should get one, brilliant for trouble shooting.